Many purchasers liked the visual aesthetics of the Inov-8 Roclite 290; they wrote that the colorways were nice to look at. A number of runners noted that they really felt comfortable while wearing this trail running shoe. Runners were generally satisfied with the performance given by this shoe; they stated that it allowed them to be more confident and secure while traversing the off-road paths. A reviewer felt that its lightweight nature was adequate and agreeable for his adventures in the great outdoors. The upper was able to hug the foot in a snug and secure manner, according to a tester. The outsole’s grip capability was reliable, a runner noted. The general durability of this shoe received some praise from those who have tried it. A purchaser commented that the toe cap was able to prevent forefoot stubbing. Inov-8’s strategic placement of the lugs keeps mud from clinging to the outsole. It scored points in the opinions of a handful of runners for its flexibility. It ran half-a-size small, according to several testers. 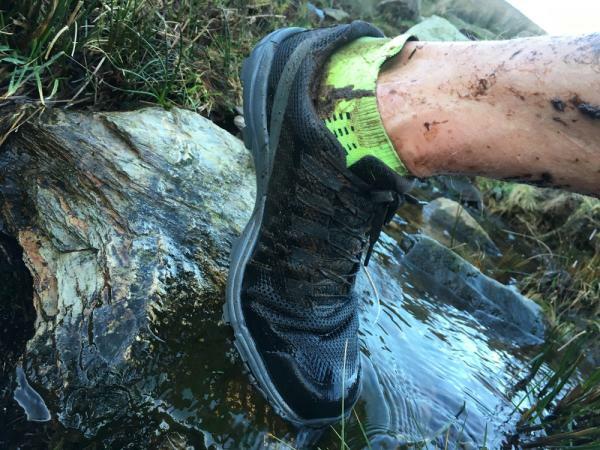 A handful of reviewers wanted a gusseted tongue to keep trail debris out. It felt too narrow for a few runners. The ventilation is compromised because of the dense and tightly-woven upper, according to a few reviewers. Many runners were able to enjoy the performance of the Inov-8 Roclite 290. They commented that it was efficient and capable when it came to their adventures in the great outdoors. They liked the looks of this neutral shoe, as well as its comfortable mid-sole and its moderately aggressive outsole. There were those who had some concerns with it, but the nitpicks didn’t lessen the overall happy experience of consumers. If you are after a versatile shoe to take with you on any off-road run, then the Inov-8 Roclite 290 is the shoe for you. This shoe provides comfort and confidence in all terrains, from wet rock to steep grassy descents, and anything in-between. It may not be the best-looking shoe in its class, but it holds the foot snugly and securely, with a rugged and durable construction that’ll take you anywhere. The Inov-8 Roclite 290 is an extremely versatile off-road shoe suitable for a variety of terrains. I am lucky to be able to run in the mountains of Snowdonia and around the coast of Anglesey. This can throw up a variety of terrains in any single run, and I was looking forward to finding out whether this shoe could handle them all! The Roclite 290 is designed to be lightweight and flexible with a sole which uses Inov-8’s Tri-C rubber compounds to provide grip, 6mm Multi-directional lugs to provide traction, and a Meta-Shank plate to protect the foot from sharp rocks. Over the last few weeks, I’ve run just over 50 miles in these shoes, subjecting them to all terrains from thick mud to snow and ice, with wet rock and everything else in between. I feel that I’ve tested them out thoroughly enough to review them. Roclite 290 in four colors including blue/white, red/orange and black/green. My shoe was the more conservative black/grey. It’s a good-looking shoe, without any unnecessary bells and whistles. It feels like it’s designed for performance, and so may not be the first choice for people who spend their weekends walking around outdoor activity shops in North Wales, but if you’re reading a running shoe review, then that’s unlikely to put you off! The Roclite 290 looks and feels rugged. The materials are hard wearing and durable, and yet the upper has a feeling of comfort throughout, with cushioning built in around the foot. This cushioning extends not only around the heel cup where it would be expected, but it also feels like there is a thin layer around the sides and across the top of the front of the foot beneath the mesh outer, contributing to a superior feeling of comfort when running. The Inov-8 Roclite 290 is listed at 290g (hence the name), which makes it comparable to a road-running shoe in terms of weight, and lighter than many shoes of this type, such as the Salomon Speedcross 4 which comes in at 310g. As expected, my UK 13 (14.0 US) shoe weighed in heavier at 388g. Most importantly, the Roclite 290 feels light when running. The spacing and shape of the lugs are also designed to prevent debris and mud from clinging to the shoe, which would otherwise increase weight as well as compromise grip. To be honest, this was my greatest concern with the Roclite 290. I’d never worn Inov-8 shoes before and wasn’t sure how they’d come up. With no half sizes available, I went for a UK 13 (US 14) which is what I’d wear in a normal, everyday shoe, and in a Brooks or ASICS shoe. For comparison purposes, in shoes from New Balance, Hokas, and Salomon I’d generally need to go for a ½ size larger (UK 13 ½). I needn’t have worried. Whilst the shoes did look a little small when I took them out of the box, this is primarily because of the snug fit. In saying that, I mean that the shoe fits snugly around your foot. There is still sufficient room in the toe box to allow a little movement, but overall, the foot feels as if it is held well, while the cushioning mentioned above provides a great feeling of comfort. My advice then would be to try on the shoe before you buy just to make sure, but if you are not able to, and that if you are “in between” sizes, then I’d recommend going for the larger size. Otherwise, you should opt for the size you’d usually choose in a pair of Brooks / ASICS or similar shoes. My first run with these shoes was to the top of Snowdon and back in late December. In the wintry conditions, the last thing I needed to worry about was my shoes, and I can honestly say that I simply laced them up, and off I went with no need for adjustment. Despite running a variety of terrains over the last few weeks, and even with the shoes wet through at times, they’ve felt secure and comfortable throughout every run, with no adverse rubbing in any part of the foot. As with most modern shoes, the upper is primarily formed from a breathable mesh. As I mentioned above, this seems to have a thin layer of cushioning beneath it, which improves the comfort and fit of the shoe without restricting the airflow around the foot. The Roclite 290 uses an “Adapterweb met-cradle” to hold the foot securely place whilst allowing the foot to move sufficiently to adapt to an ever-changing terrain. It also includes a “Y-Lock” system of welded overlays to hold the heel in place. As would be expected from this type of shoe, the tongue is stitched to the shoe to prevent ingress of debris. What all this means in practice is that the shoe feels secure and comfortable and like a part of the foot itself. I never once felt that the shoe was likely to come off, or that the foot was moving around inside the shoe. Even when the shoes were wet through after fording a stream, they still felt completely secure, and the foot did not slip at all within the shoe. The toe cap at the front of the shoe is produced from strengthened rubber to protect the toes and comes a short way around either side of the shoe. The toe portion of the foot does not protrude, therefore reducing the risk of an unexpected tumble from catching a toe on stones and rocks during a rapid descent. The “Powerflow” midsole in the Roclite 290 has apparently been designed by Inov-8 to deliver 10% better shock absorption, and 15% more energy return than standard midsoles. To be honest, I can’t really comment on the accuracy of these statements, as the surfaces I’ve been running on vary so much in terms of their own shock absorption and energy return. Suffice to say, the shoe felt comfortable even on hard surfaces. The shoe has a 4mm Heel to Toe drop though, again I tend to find the heel-toe drop less significant in fell running shoes than in road running. The outsole is constructed from a “Tri-C” rubber compound which utilises different types of rubber in different areas of the sole; a soft sticky rubber on the inside and across the centre of the sole to provide excellent grip on rocky terrain, a harder endurance-like rubber endurance on areas such as the heel to ensure durability, and hard sticky rubber on much of the forefoot for the optimum balance between wear and traction. The sole incorporates 6mm multi-directional cleats, each with a wide surface area to provide fantastic grip on a variety of surfaces, but with sufficient spacing to prevent the accumulation of mud and debris. A “Metashank” rock plate protects the underside of the foot from sharper rocks and stones underfoot. My first run in this shoe was a couple of days after Christmas. I looked out of the window at the covering of snow on Snowdon, and decided that instead of looking up at the mountain, I’d rather be on top looking down. I took the Inov-8 Roclite out of the box, and off I went (that’s why there’s no pictures of a fresh, new looking shoe – I was too impatient). The first mile or two are on tarmac. It’s not what the shoe is designed for, but as many routes include some hard surfaces, it’s important that the shoe feels comfortable on roads, and this did. The midsole absorbs the impact with the ground effectively, and most importantly it doesn’t feel as if you’re running in a studded boot as some shoes can. After the initial steep tarmac section, there’s a long section of path which incorporates various types of rock, some fairly random and others formed into irregular steps, at differing gradients. On this day, some rock was wet. The shoe was comfortable, and I was confident in its grip throughout the ascent. Past halfway, and I reached the snowline. The “steps” of Allt Moses had a mixed covering of snow and ice with some light scree in sections. Despite my legs beginning to protest, the shoes were great; no slipping at all as I moved on towards the steep section after Clogwyn. At this point, the snow was thicker, hard packed in some sections, and looser in others. Once again, the shoes proved to be able to cope with all terrains, offering grip throughout the ascent to the summit. The wide spacing of the cleats provided grip but prevented snow from clinging to the shoe. As mentioned above, the shoe incorporates a thin extra layer of cushioning below the mesh, and this helps to keep the foot protected more from the elements (including the cold) than some other shoes have done previously. A quick turnaround on the summit, and then time to head back down. In my experience, it is in descending that one can really test how an off-road shoe performs. As a heavier runner, I’m acutely aware that a shoe has to do a lot of work to enable me to change speed and direction quickly and to hold my foot in place as I move. I’ll admit that on this particular day, my descent was rather more cautious than usual, due primarily to the cold and the ice, but I have since returned to Snowdon and other mountains to test the shoe on a variety of terrains. One of the toughest tests is often wet rock, and surprisingly, the shoe performed incredibly well on this surface. The reason I was surprised is that this is very much an all-rounder of a shoe, and I’d expected the 6mm cleats to compromise the grip to a degree. Because of the large surface area of the cleats, however, and the rubber used, the grip is fantastic. Usually a cautious descender, I became ever more confident wearing this shoe, and am sure that the more I run in this shoe, the faster my descents will become. As with many mountains, the paths around Snowdonia are comprised of mixed, uneven terrain made up of large and small rocks, often with gravel and screen filling the gaps in between. Again, this shoe handled this with confidence, even on faster descents. The fit of the shoe means that there is no discernible movement of the foot inside the shoe, and the grip means that the foot stays where its placed as the next foot moves forward. This really is a shoe that inspires confidence. Off the tracks, and onto the fells and mountainsides requires descents on a variety of grass surfaces. Once again, the shoe handles well. During the winter months, wet grass and mud offer their own challenges, and there’s often the chance of ending up on your backside if the foot slips away from you as you plant it. The Roclite 290 again performed incredibly well, with the wide cleats easily providing grip on a range of grassland, and again providing confidence during the decent. Again, the foot was held well, and there was no movement within the foot, even when the shoe and foot became wet through. The only surface I found the shoe to be out of its comfort zone a little was on thick mud; the large surface area of the cleats that provide such great grip on rock isn’t quite so well suited to mile after mile of muddy fields. 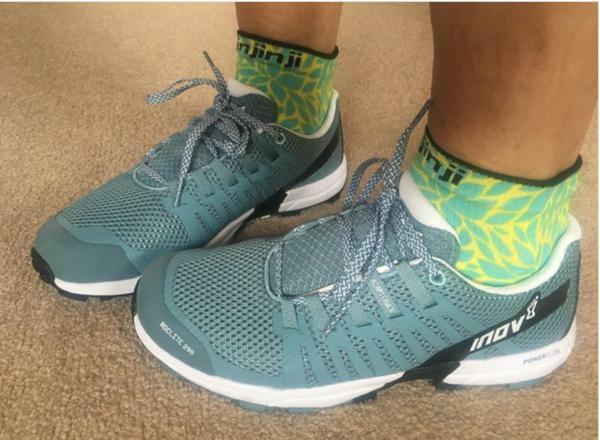 Having said that, Inov-8 have plenty of shoes specially designed for that type of terrain (eg X-Talon, Mudclaw), and so if most of your running is to be on these surfaces, then these may be your better option. Unless your running is likely to be exclusively on muddy fields and fells, however, then I’d suggest that the Roclite 290 is still a great choice. In summary then, the Roclite 290 is a fantastic all-terrain shoe that will give you confidence in running across a range of surfaces and is my new go-to shoe for any off-road running. The only meaningful comparison I can make is with the Salomon Speedcross 3 which had been my faithful off-road shoe for the last couple of years. I can honestly say that the Roclite 290 is superior to my Salomon shoe in almost every respect. A quick glance at the image will illustrate why the grip of the Roclite is so much better on all surfaces. Another significant point is the shape of the toe; the Roclite 290 has a more rounded toe section compared to the more pointed toe of the Speedcross 3. This makes it less likely that you’ll catch the toe on rocks and stones which can cause a stumble during an ascent, or more dangerously, during a fast descent. The other factor to consider is how I’ve mentioned the way that the Roclite 290 fits snugly to the foot and holds it in place. In the Speedcross 3, I found the foot moved around significantly, especially when the shoe became wet, and also during steep descents when the toes could crash painfully against the front of the shoe with every footfall. If you want a trail shoe that you can just lace up and then head out onto any terrain, and not even have to think about until you take it off at the end of the run, then this is that shoe. Once the Inov-8 Roclite 290 is on, it’ll take you comfortably and confidently along any terrain you want to throw at it so that you get the best out of your run, wherever it takes you. Will the new Inov-8 Roclite 290 light up your runs? These are the new Roclite 280s. I am a big fan of the 280s and wore a pair on and off for a couple of years until I felt they had seen enough action and needed to be retired to the loft. I really liked the light and airy feeling of the 280s and the excellent grip from the chunky studs gave me lots of confidence going up and down trails. So the big question is, does the new arrival live up to its illustrious forebearer? The design here is quite different from the old Roclites. The 290s feel more like a road shoe as there is much more padding around the ankle collar and tongue and the upper is made from a soft road shoe like material. The sole is like a traditional trail shoe with shortish, well placed studs with support between the forefoot and the heel. In between the sole and the upper is a thin layer of padding, giving a heel to toe drop of 4mm whilst providing a good amount of cushioning on trails. The new design came along with bright colours. Don’t worry as there are others if you don’t want to stand out quite so much and it gives the 290s a softer look compared to the tough mudder style of the previous version. Personally, I think they look great. The upper is soft providing quite a cosseting fit around the toes, not tight like some the precision fit shoes from Inov8, similar to flyknit road shoes and more comfortable than some of Inov8’s more fell run based shoes. I wear a 10.5 in all running shoes and the 10.5s fitted me fine. If I was between sizes I would go up rather than down due to the snug upper but generally they run true to size. The adapterweb lacing system allowed for plenty of adjustment to give a snug and secure fit and laces were really grippy so there was no chance of them coming undone mid run. I have run with the 290s on the road to reach a trail and they felt fine. I wouldn’t run too far on the road on them mainly because I think the sole tread would wear out. The Powerflow midsole gave plenty of cushioning and energy return on the road but once you reach the trail these shoes come in to their own. The grip is great and the low heel to toe drop allows for quick direction changes and all the stability you could want. I have only worn them in the spring and summer so not too much mud but up and down trails they felt great. As long as the trails are not too far away the 290s make a good road to trail shoe, perhaps a bit heavy for all out racing but certainly a comfortable place for your feet to spend the day. You get lots of fancy words all over Inov8s. The studs are well spaced to not collect debris and provide plenty of grip on grass and packed trails. The Meta-shank rock plate works well giving plenty of protection from sharp rocks without feeling too stiff and rigid. I doubt there would be enough grip for deep, wet mud (back to the Mudclaws for winter) but for spring, summer and autumn they will give me plenty of confidence to charge up and down trails. Too much road running will no doubt wear down the tread from the studs eventually but they seem to be holding up well so far. In my opinion, the Roclites are more about long distance comfort than all out speed. They don’t feel super heavy but not super light either. The tread and cushioning allow you to run at a good pace that you can keep up for a fair while. I have run a few Parkruns and 5 to 10k training runs in the 290s so far and they felt springy and forgiving and my feet and legs felt like they had been well cushioned and protected throughout. The new Roclites are a more than adequate replacement for my old ones. In terms of comfort and style I think they are a definite improvement. I would be much happier running from road to trail in the 290s and they are a definite all day shoe for me. I will keep them for the drier months as the upper does not look as though it would fare that well against deep mud but I have not tested this out. So these probably aren’t the shoe if you are looking for a winter blaster or obstacle race shoe, they are far too comfy and good looking for that. Otherwise, Inov8 have done it again by making an already good shoe sharper looking and more comfortable. If you have the desire to explore, they will carry you there. A comfy shoe that will take you from roads, track, trail, chalk, rock, hill and mountain through to the high street. With the Innov8 name to them, I was keen to get my hands on a pair finally - from the south downs where I train daily, to the mountains in the lake district, lochs in Scotland, speed sessions on road and the Sussex beaches. Let me share exactly where these shoes belong in my life. With a relatively low drop of 4mm, these shoes are designed with the neutral runner in mind. Perfect for someone who likes zero to a 4mm drop, forefoot runner like me! Having tried these on in a local shop, I opted for ½ a size up on my normal street shoe, allowing for that little bit extra in the toe area. They did not feel too narrow, and I have not experienced a problem with rubbing anywhere. Although as you can see from the picture, I do lace my shoes a little differently to allow for room in the toe box and arch, this is just a personal preference and not a reflection on this shoe in particular. It was not "love at first run" though. On arrival, they did take a fair time to wear. As a forefoot runner, the balls of my feet were subject to some hard wear until they were fully broken in. This took about 100km of running. With some shorter runs to get used to the cushioning the Innov8 Roclites offer. The lugs on the Roclite 290 have proved to be indestructible - quite literally. I did try my hardest to break these and put them through their paces in the name of a fair trial. With a unique triangular grip pattern that offers a firm grip on rocks, hard ground and slippery ground alike. It would also appear with just enough precision spacing between the lugs for nothing I have found to run on to stay within the treads. Self-cleaning it would seem is indeed a feature! They have been tested on soft mud, grass, rocks, roads, track, trail and ice. There is very little wear to any part of the sole, even with being a forefoot runner - truly very impressive! It is not slipping at all on descents or steep inclines. They have proven themselves time and time again on the tricky ground in the mountains and south downs. But with just as much response on roads and sand. A sticky responsive trail shoe it has proven to be. There is so little wear in the toe box area. The re-enforcing around the front of the shoe really does work wonders and is very comfortable. With room inside to spread the toes and give a fairly responsive feeling. If you desire a trail shoe to give you that little bit of support that a low drop shoe usually lacks, this could well be the creation you crave. There is a very reasonable amount of cushioning underfoot and surrounding the foot arch to give the feeling of support. For me, this lost some of the response I enjoy feeling in a low drop shoe, but would indeed be a wise choice for longer ultra runs. Having tested these up to 20k on various runs they have proven comfortable and a firm favorite. I would love to carry on telling you all about the amazing grip and feel of these trail shoes. But for me, there was a fairly big drawback that has come up time and time again when I wear them. And that is when running in any kind of damp environment the upper and cushioning material soaks up any kind of moisture. My feet self regulate temperature nicely, so sweating was not a problem for me. But dew, streams, puddles and any kind of rain was a bit of a nightmare. Once wet, they stayed very damp and would not dry out until packed and properly dried out. Certainly not while they are still being run in. Which did make for some unpleasant mountain running at times when stinking the car out (thank goodness for a running partner). They also do not pack down very well, as a person who likes to travel with my trail shoes to hand, I’d have liked a shoe that could fit a little more comfortably inside a travel bag. With that out of the way, some more on where I had the pleasure to test these out. Scafell Pike provided the perfect setting to try some steep ascents and technical inclines. Moving over icy grounds in early January for 16 kilometers, they showed themselves as a very comfortable, safe, daring shoe. The fit was as snug at the start as it was at the end. I was navigating icy rocks with ease, slippery grass descent, and the cold weather. This was a turning point in the Roclites for me. I’d trust them on an extreme trail race with confidence after this outing. It is hard to explain just how little wear is visible after over 250km of running. These look set to be my go-to shoe for the next season's ultras and training. For a shoe that is going to last, they certainly seem to warrant their price tag. The bottom line for me, after testing these for a few months, through a change in season (good weather and bad) they have shown their colors. Some absolutely fabulous traits you just can not ignore with comfort, durability, wearability, quality, grip, and self-cleaning lugs. While it can not be taken for granted the less than convenient absorbing qualities, which is not an issue on shorter runs. But longer runs this soon became a hindrance and a real consideration for when they have been worn in future. In favor of some trail shoes which material dries while I can continue to run. Being a trail runner this is something that can not be forgiven. Also, the long wear-in period was a struggle at times. That being said, I will be bringing these to the Isle of Arran with me for a two-day ultra race. With some newspaper and a separate porch to let them dry in! Overall? A great choice for any trail runner. It feels light, flexible and reliable when put to the test. The Inov-8 Roclite 290 is a performance trail running shoe for runners who have a neutral foot-pronation. This model in the Roclite stable of off-road shoes is lightweight and flexible. It has a non-bulky design that’s unlike most of its ilk. It also has a smooth and consistent upper construction, which makes it visually appealing. The upper unit of the Inov-8 Roclite 290 utilizes a lightweight and breathable mesh in order to provide comfortable coverage for the foot of the wearer. The open construction of this material maintains ventilation, which is helpful when it comes to long trail running sessions. Synthetic webbing and welded overlays hug the foot in place and prevent it from wiggling inside the shoe. The mid-sole unit of this running shoe makes use of a foam technology called the PowerFlow. It provides responsive cushioning and shock absorption, making the runner more energized and enabled with each step. The second-generation Meta-Shank in the mid-sole serves as a shield against rocks and other debris on the trail. Three different rubber compounds are used for the external sole unit of the Inov-8 Roclite 290. They work together in order to protect the mid-sole and the foot of the runner from abrasion and other aggressive objects on the trail. A moderately aggressive lug pattern is present in this shoe. It’s designed for various types of ground, even rocky and uneven terrains. The Inov-8 Roclite 290 has a standard running shoe length. It comes in sizes that follow the regular preferences of runners. The available width for the men and women’s versions is medium. It allows those with medium sized feet to acclimatize well to it. The semi-curved shape mimics the natural curve of the human foot. The outsole unit of the Inov-8 Roclite 290 features the Tri-C compound, which is a combination of three rubber units that work together to provide high-quality traction and protection against surface abrasion. It doesn’t peel off easily, as well. The Tri-C compound is also utilized in the outsole of the Trail Talon 235 and other well-known Inov-8 running shoes. The Rocklite design of the outsole has moderately aggressive gripping lugs. This design allows the shoe to be efficient on multiple types of surfaces, including hard or rocky trails. The Meta-Flex™ is a horizontal groove in the forefoot section of the shoe, and it allows the runner some flexibility in order to move more naturally through the gait cycle. The forefoot toe-off is the phase that benefits most from it. The PowerFlow is a cushioning technology that’s present in the Inov-8 Roclite 290. It provides the runner with 10% more shock absorption and 15% better energy return than most industry-standard mid-soles. It’s responsive, flexible and it doesn’t sag easily. A rock plate called the second-generation Meta-Shank shields the underside of the foot from rocks and other potentially injurious objects on the trails. Its presence doesn’t sacrifice the flexibility of the shoe. This shoe has a 1 Arrow Shock Zone, which means that it has a 4 mm drop, as well as medium levels of responsiveness and cushioning. Breathable mesh is used for the upper unit of the Inov-8 Roclite 290. It protects the foot and keeps it comfortable by accommodating airflow into the foot-chamber. It’s also light and flexible. The ADAPTERWEB Cradle is a webbing that’s made with synthetic materials. It wraps around the foot in a secure manner, and adapts to the motion and swelling of the foot during each running session. The Y-LOCK System is made of welded overlays that keep the rear of the foot in place, thus preventing wobbliness and unintentional shoe-removals. A Toe Cap acts as a shield that prevents objects and surfaces from causing pain or injury if the foot collides with them during the run. There are Gaiter Hooks on the shoe. They allow the runners to easily affix gaiters if they want additional protection from debris.